I couldn't help but notice, I've had this up for more than two years now. Glad some of you still find it useful. However other than some demographics, and the narcissistic right to brag about the download count, I don't have a feel of how (or whether) folks are using this, or if it is just collecting dust on one's hard drive as just another collectors item. You're all encouraged to post screenshots, videos and/or talk about how you're making use of this template, and help me try to raise the feature list a notch, in the process. After spending a long time developing courses and/or course demo's/concepts I realised I spend far too much time on the menu/navigation/progress side of things instead of fully concentrating on how to effectively present content. So at some point I started wondering of ways with which I could minimise the time and effort needed for all this, in order to focus on the latter, more important tasks. 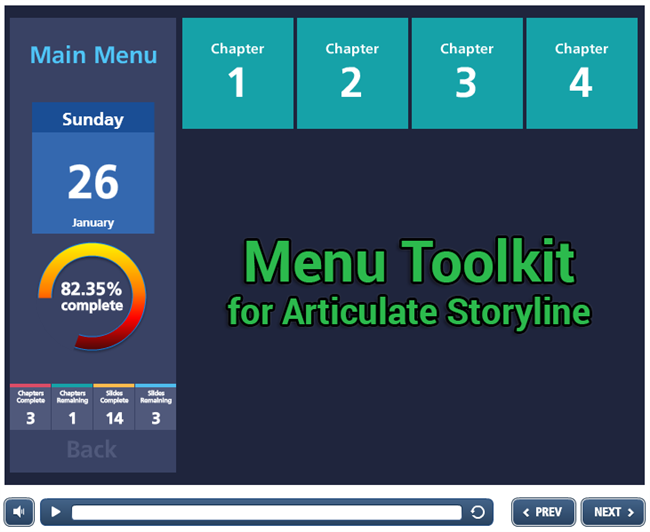 With this template you can create and populate your course ToC automatically by modifying just one Storyline variable. You will then find that all Scenes/chapters and slides will be appropriately visible inside the menu and all course progress statistics will be calculated automatically. Easy to modify - use the stock Articulate navigation buttons or create your own. The demo can be found below, although to fully appreciate the template, you should probably download and play with it, and then publish to FTP. P.S. : I realise the sign up is tedious, but it really helps me get country information on downloads (which is the only metric I am currently interested in, as far as analytics go). Alex, this is amazing! Thank you. Still playing around and getting a feel for what you put together, but this looks really great. To get a better feel about it, just show the currently hidden text box labeled 'DEBUG'. It is on the base layer of the Master Slide. After publishing again, it is just a matter of flicking through the next/previous buttons to see how those variables behave. +1 to David's comment, Alex... I'm looking forward to digging into this. Thanks for sharing! That is great Alex, thanks for sharing! Wowsa! Get the concept, not sure I'll grasp the how to right away, but really impressed! Well done Alex, thanks for sharing! Well, I wanted this to be a "1-2-3-bang-here you go" solution, which is especially during situations where I have to send (free) customised demos for contracts i am pushing to win. This just saves the time to go through the menu and progress statistics (2 things my clients tend to request a lot). If - say - you would rather have a list of chapters/slides rather than flat boxes, all you have to do is change the size and positioning of those elements inside the two layers on the Slide Master. If you would rather use your own back/next buttons, then again all you just need to make sure the custom navigation works - all calculated progress statistics are completely separate and will work regardless of the way you want to navigate. You can even use the stock Player Menu if you like as well. If there's any questions, let me know, I'll try to answer them straight away! Εξαιρετική δουλειά Αλέξανδρε. Σε ζηλεύω!!! Nice separation of the presentation layers vs the logic layers so folks have flexibility to tweak the skin but get all this functionality. Seems that the progress is purely based on "slide count" but I assume you can also add quizzes as a passing parameter as necessary (but this won't impact slide count unless you put in controls to impact navigation - i.e. "cannot proceed until quiz is passed"). You are exactly right. 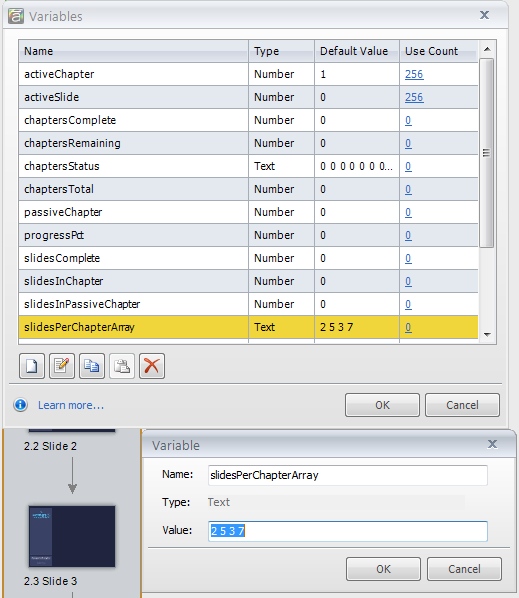 As long as you don't set a value for 'activeSlide' and 'activeChapter' on your slide, they won't count as part of this. The downside of this (right now) is that these slides will not be linked to the menu. If you want to include a test you would have to copy all triggers and JS over to the quiz Masters and add/set the other two triggers (activeChapter and activeSlide) to your regular question slides. I am currently mulling over whether to extend this a little further or not, so any ideas are welcome. This is a really great share. Adding my thanks to the thread, Alex. Great idea and great execution. I couldn't have said it better myself John. Great work Alexandros! That is really useful, great work! Thanks! Nice to share with us. Took a lot of time to create I suppose. W.O.W. Alex, this is awesome. Thank you so much for sharing the file and the "how to use" story - this was really generous of you, and it's really, really appreciated!!! Now I just need some time to dig in and play around with this template - I'm so excited!!! Hey, how does it feel being the poster boy for SL2? Getting any residuals yet? Sorry Mike, that isn't me. "Εξαιρετική δουλειά Αλέξανδρε. Σε ζηλεύω!!!" "Hi Craig, Sure. In this case, I believe the only thing you need to..."
"Thanks. I sure wish Articulate would create some variables (propert..."